At White Construction and Design, we are constantly updating, revising, and refining construction techniques and use of materials to improve the energy efficiency of the building we create. Because of our long history in construction we have been able to sort through what does or doesn’t work in the evolving world of construction science. We employ the latest green building techniques in our fabrication, insulation and product choices. Geothermal Mechanical Installation - The Cadillac of mechanical units whether being open or closed loop systems, these units are unbeatable in performance in certain houses coming in excess of 26 SEER efficiency ratings. WE DO NOT USE BATT INSULATION IN VERTICAL WALLS, EVER. Radiant, and Electric Floor Heating, Fresh Air Intake - Cost effective and comfortable for a nice touch. Air Cycler Controller Intake - White Construction considers this mandatory in certain insulation packages. This healthy solution keeps a minimal positive pressure inside the home. Positive air pressure creates a healthier environment by minimizing dust, and stale air from encroaching a typical house, which is under vacuum. This also is necessary on high quality construction that is air tight to in order to properly manage air circulation. Continuous Foundation and Sealed Crawl Space - In the initial construction of a home, White Construction digs a continuous footing usually exceeding that of code requirements. A continuous masonry wall using filled 8" x 16" blocks is constructed continuously around the perimeter. With no exterior piers, the possibility for point settling is greatly minimized. All White homes (unless requested otherwise) will have a sealed crawl space that is climate conditioned. After backfill is added to the crawl space, bringing it higher than the outside elevation, a 3" concrete slab is poured and finished under the home on top of a 6 mil barrier of poly plastic. 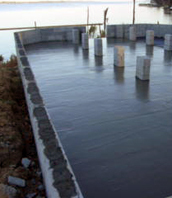 The concrete in part protects the plastic thus providing an impenetrable barrier for sub terrain moisture. Multiple circulation fans and central dehumidification are installed to ensure mold and mildew will never be a problem to contend with. The humidity level and temperature of the crawlspace are regulated from within the homes. This finished floor system also makes it wonderful in future to add to or modify your home from beneath. a. 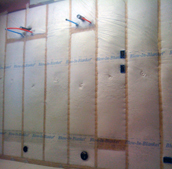 All exterior house walls serving as the insulation air barrier will be a minimum of 2” x 6” walls. All glass in windows and doors will be double pane, Low E / Argon–thus providing for the maximum efficiency in the construction industry. No U-value will be greater than 0.49 and no solar heat coefficient will be greater than .058.
b. All Mechanical systems will be 16 SEER in efficiency or better. Ducts will be designed to allow for no more than 3% duct leakage. (e.g., a 2000 square foot house shall not have more than 60 CFM of duct leakage.). c. An ACCA manual J-based load calculation for equipment sizing and ACCA Manuals D and T calculation will be used to assist with room by room air flow requirements. d. There will be a continuous, durable air barrier totally surrounding all conditioned space wherever possible. e. The house air tightness will be constructed such that the mechanical leakage should not exceed 0.30 cfm per square foot of the house envelope when tested at 50 Pascals of pressure. How many times have you ever heard of someone becoming FRIENDS with their builder? Most of the time it’s a love/hate relationship at best because you love them in the beginning and hate them at the end of the project! Eddie White breaks that mold. He built our first house. After looking at literally hundreds of house plans we were exhausted and still had not found exactly that thing we had dreamed of. Finally Eddie put away all the plans and asked us to tell him just what we wanted in our house. We talked he listened and then put on paper what we had dreamed about for years. He has a unique talent for transcribing ideas into reality. By the time the construction phase came around, we trusted him enough to give him carte blanche on hundreds of details most other new home owners stress over. Great move on our part! Eddie White would never do anything to cut corners on his projects. We love our home and we have Eddie to thank for it! This builder is an honest hard-working man that will take care of you. Trust his judgment – he knows what he’s doing! Copyright � 2012 WHITE Construction + Design - All rights reserved Web Site Design & Hosting by Evolve, Inc.